It’s a girl! We welcome yet another pooch onto our Ark. It is my pleasure to introduce the lovely Border Collie Augie. She’s the happiest dog on the block. My her smile bring you joy on this day. Psst… She’s not really living with us. She’s happily living at her real house with my sister and her husband. We got to see Augie over the weekend, and I just couldn’t resist sharing her smile with you. 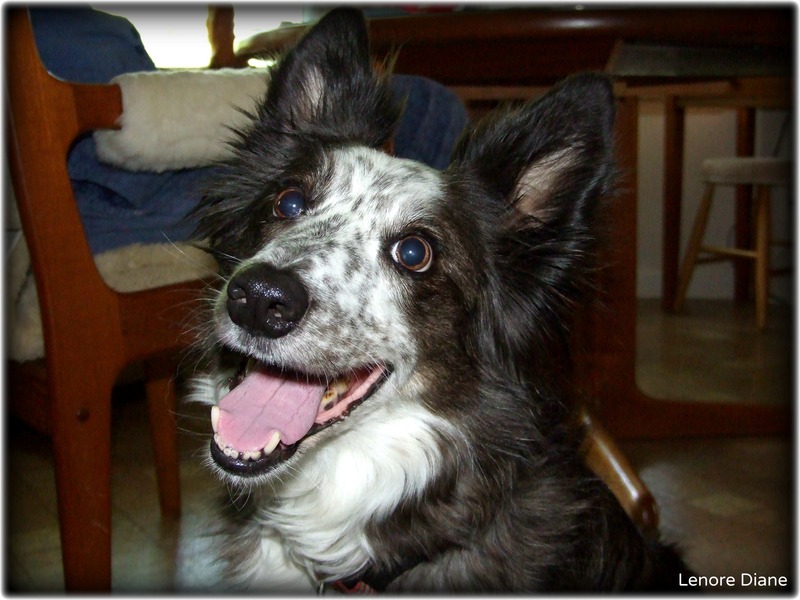 We used to baby sit our neighbor’s border collie; Brandy was a sweet and very protective dog. Not to mention beautiful. I’m not sure how protective Augie is, Maxi – but she is certainly beautiful, sweet, and fun. Blessings to you. Oh my goodness–she looks like she should be in an ad!!! She is wonderfully adorable!!! How can you not smile looking at that face? My sentiments exactly, Beth Ann. I LOVE when dogs smile!!!! LOVE LOVE LOVE!!! I agree, happiest dog on the block! She’s lovely! Prime pooch photo, Ms. D! Augie!! She is so cute – and I love that name! I am grinning away looking at her. I am glad you are grinning, Jules. One cannot be around Augie and not grin. She is such a happy dog. She is so very lovable, Leah. She’s a beauty! What a unique face. Do you know what breed she is? She is a Border Collie, Jackie. She was a runt of the litter, and she remains smaller than many. She makes up for her smaller size with her large personality and smile. Such a beautiful dog – And that smile. Brought a smile to my face, for sure. Then my work here is done, K8. Glad this made you smile. OMG, I’M SO HAPPY, SO HAPPY, SO HAPPY! HEY LADY, WHAT’S THAT THING? IS THAT FOR ME? WHAT’S A PICTURE? DON’T CARE! IT MAKES ME HAPPY! HAPPY! SEE? I’M SO HAPPY, OMG, OMG!…. (pant pant pant)…OMG I LOOOOOOOOVE YOOOOOOUUUUU! Hahahahaha! I get it Leonore! Completely. I do the same thing. I’ve been known to stand at the base of a tree, watch two squirrels chase each other, and provide a running dialogue of their conversation. I amaze my friends with my ability to speak ‘squirrel’. 🙂 I was born to speak dog – that skill of mine is no where near as impressive.